The FirePlace Mod for Minecraft adds one block type to the universe that simulates a fireplace with the ability to be lit by steel and flint, and punched by the player to be put out. 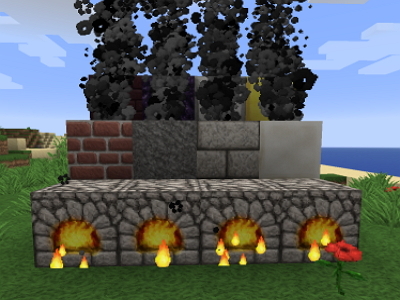 This mod adds a chimney type block which secrete smoke to give the player an aesthetically pleasing effect, and a grill so the player can prepare food in their fireplace. This mod is being updated consistently, so any bugs that a player may come across will most likely be ironed out in a timely manner. This mod saves those who wish to have a fireplace in their homes so desperately that they end up setting that home on fire.